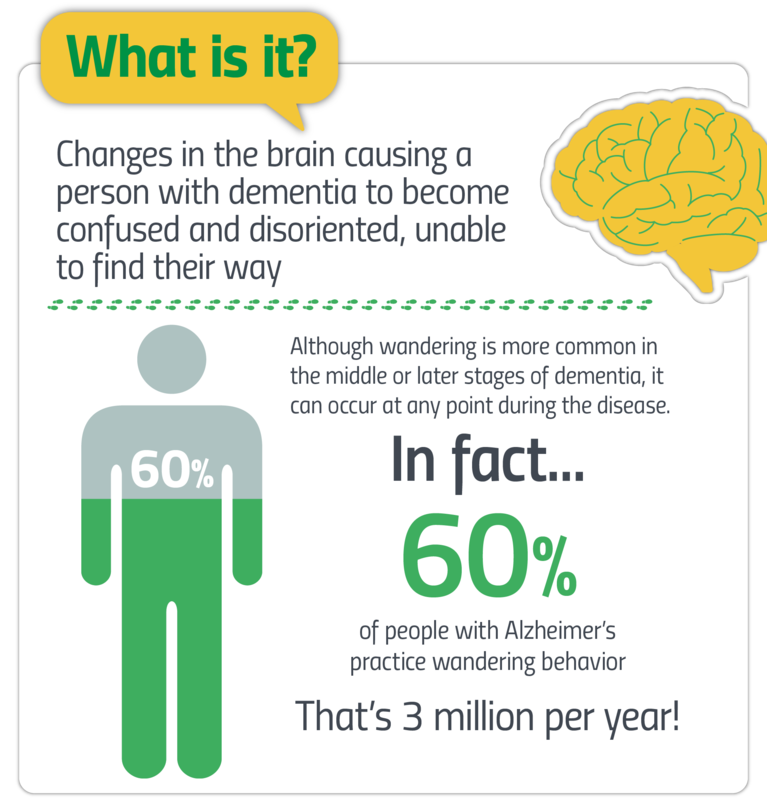 Wandering is one of the most common symptoms of Alzheimer’s disease and other types of dementia. Although dementia-driven wanderers are typically found near their homes, they may not think that they’re lost or ask anyone for help. Reasons for wandering behavior in people with Alzheimer’s disease can include cognitive deficits, stress, and physical and social aspects in their environment. Some of the risk factors for dementia-related wandering are the severity of their condition, disorientation, sundowner’s syndrome or the “going home” syndrome, etc. 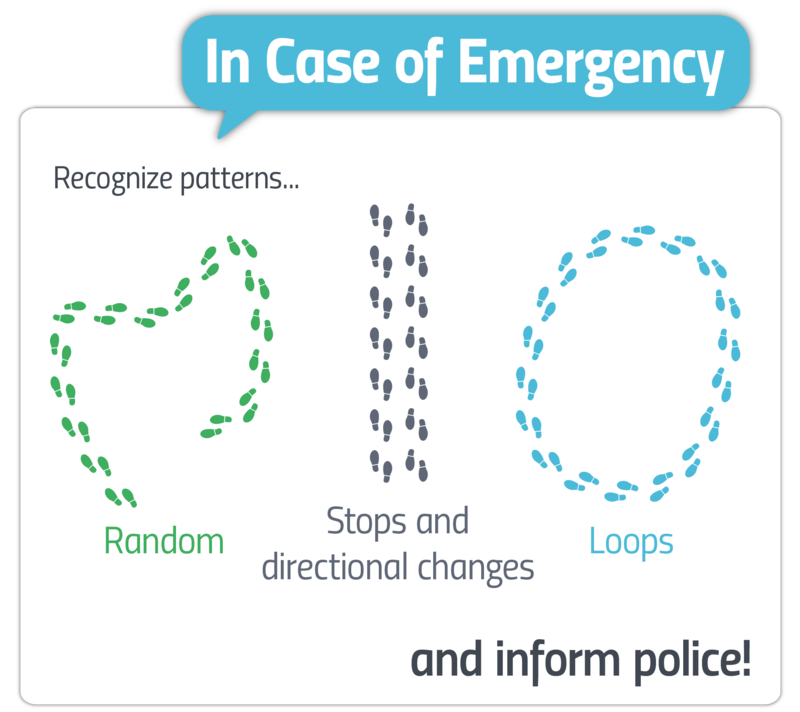 Wandering can occur in a random pattern or a lapping type, i.e. going around in a looping fashion. It is important for caregivers to know about the person’s lifestyle prior to the onset of dementia, and they can follow tips like securing the environment or using identification tags or tracking devices. Almost all sufferers of Alzheimer’s Disease or various other types of dementia exhibit the symptom of wanting to “pick up and go”. Although naturally more restrained, individuals with early onset dementia can show similar behaviors. Potential reasons for wandering behavior may include a changed environment (new house or day care center), memory problems, excess energy, boredom, mixing up night and day time, agitation, discomfort or pain, or difficulty distinguishing dreams from reality. Additionally, if someone has always enjoyed walking long distances, they may desire to continue with this practice. This article examines wandering, from early signs to potential dangers for individuals with dementia and steps loved ones and caregivers can take to support their safety. Dad might remember your name, and where he left his eyeglasses, but he has Alzheimer’s disease, and although no early signs of wandering have as yet appeared, he’s nowhere to be found. Wait a minute, who’s at the door? It’s that crazy woman who lives two houses down the street. “Next time I’m going to let him stroll onto the highway,” she yells, clasping Dad by the arm. “If he does, next time I’ll just let him keep going.” The woman has obviously had all she’s going to take from both you and your dad -Alzheimer’s and all. You apologize again, feeling helpless, worried, and exhausted. The wife of a prominent journalist wandered off one day not too long ago in Silver Spring, Maryland. Names, locations and events have been altered to preserve the privacy of those involved. To cut a long story short, the police gathered a posse of some forty volunteers and two K9 dogs to search for her. They realized that she had Alzheimer’s disease or another type of dementia. They went around for the better part of a long day and evening, covering a two-mile radius of where she lived. They beat every bush and turned every stone, each search gang coming back repeatedly to where she lived and starting over in new ways and directions -to no avail. In the end, and only by miracle, as someone practically stumbled over the woman, she was found crouched for warmth behind some shrubs in a neighbor’s back yard. The lesson learned from that episode was that it is ten times as difficult to find a wanderer who is on the move. The woman had been turning in circles as the search parties themselves turned. She was found only minutes after she stopped moving, in apparently reasonable health. However, these instances can be incredibly frightening and not everyone ends up so fortunate. Other wandering cases are not as harmless. We won’t bother to hide names and events on this one as this family’s story went into the public realm. In May of 2008, Chuck Springer, a retired long distance trucker with either Alzheimer’s disease or some other dementia, made all the local news out of Belmont, Maine. One lovely spring day, he walked out of his house and hasn’t been seen since, not by his family, not by the police -nor even by the FBI. His mother, Ellie Springer, explained that Chuck, despite his Alzheimer’s disease, used to take long walks by himself around the neighborhood and in the nearby woods, and that although he was known to be a dementia-driven wanderer, he would stroll away for a couple of miles along the highway, but that he always made it back home on his own. Not on that occasion though. On that day, Chuck, who had a passion for long-distance hauling, took off and never made it back home, despite serious search efforts. The only hope his family still has is that he may have been picked up by another friendly trucker. Years later, they still don’t know whether Chuck is a mile or a thousand miles away, or if he is indeed still alive and in relatively good health. Wandering is a fairly common occurrence among individuals with dementia. Everyone involved with Alzheimer’s disease and wandering has likely had the same first remedy in mind: to figure out the best ways to secure the environment and protect the health and safety of their loved ones. Some have suggested that wandering can be beneficial as a form of exercise, and that walking should be encouraged as long as the living environment is secured for persons with dementia. The idea that individuals with Alzheimer’s who live at home with family or hired caregivers ought to be allowed to roam the entire zone of safety leads us to believe that wandering might not be so dangerous. While it may be true that wandering as a form of exercise can be beneficial, it is important to take safety precautions for a variety of reasons, as dementia-driven wanderers can get lost or hurt, and in memory care facilities, they can also interfere with the activities of others. Citing the continuous flow of alerts for missing individuals with dementia, the Alzheimer’s Association deems that wandering has reached crisis proportions. They estimate that 60% of people with dementia exhibit wandering behaviors. That puts the yearly figure of dementia-driven wanderers in the U.S. at around 3 million. In addition, as the number of individuals of older age increases, the number of individuals with Alzheimer’s and other forms of cognitive decline will also increase, suggesting that wandering may become a growing problem. It is also known that individuals with Alzheimer’s are more susceptible to wandering than others with vascular or any other type of dementia. 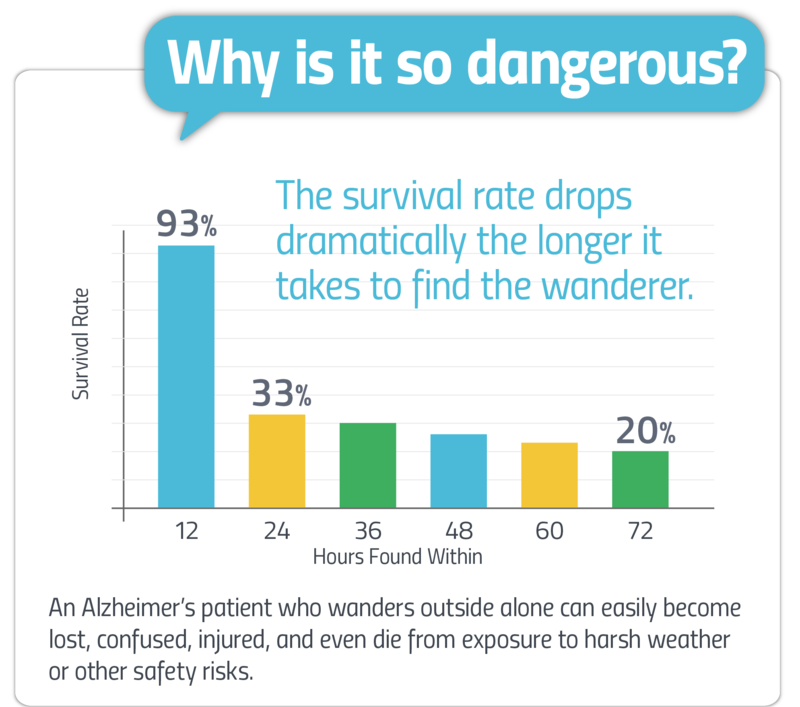 It has been found that when dementia-driven wanderers are found within the first 12 hours, 93% survive, which means that 7%, or one out of every 14 individuals with dementia, do not survive. Putting it yet less gently, one out of every 14 Alzheimer’s patients who wander don’t make it back home alive. The stats for individuals with Alzheimer’s who are not found within the first 24 hours are naturally worse. Of those gone missing for 24 hours, the findings are sobering: only a third dementia sufferers survive. Of those wanderers with dementia who go missing for 72 hours, only one in five are found alive. On the positive side, individuals with Alzheimer’s who wander are typically found within a mile and a half of their homes. However, wandering can be dangerous for individuals with dementia because they may not ask anyone for directions or help, may not remember their name or address, and can become disoriented and afraid. They also may not tell anyone where they are going or leave clues as to their whereabouts. Read about other real-life stories of wanderers on this page by Dave Baldridge, Executive Director, International Association of Indigenous Aging. The precise type of wandering and the Alzheimer’s sufferer’s ensuing demeanor or character traits are a function of several factors, the most significant being the overall cognitive deficits that their type of dementia entails. Other relevant factors include health status, stress, physical and emotional needs, and physical and social aspects of their environment, i.e. in the family home or in a memory care ward. The personality and interests of individuals before their diagnosis can also predispose them to some extent to wandering. Individuals with Alzheimer’s disease may suffer from forgetfulness and confusion when it comes to their name, where they are, and the time of day or night. Memory loss adds to the overall mix-up, leaving them unable to identify accustomed people and environments, at times even with early onset Alzheimer’s. Individuals who have Alzheimer’s disease and wander may be dreading their current setting (especially if in a nursing home) and attempting to find a more familiar environment. They may seek a destination from their past, like going to work or to the grocery store they frequented when they were in better health. “Going somewhere else” is a common motivation for wandering behaviors in individuals with dementia. Often confusion for individuals with Alzheimer’s disease peaks at sundown, particularly in living facilities and memory care wards when there is the added commotion of visitors, dining arrangements taking place, or when personnel shifts changes are occurring. “Sundowning” may lead to increased agitation or restlessness and wandering. 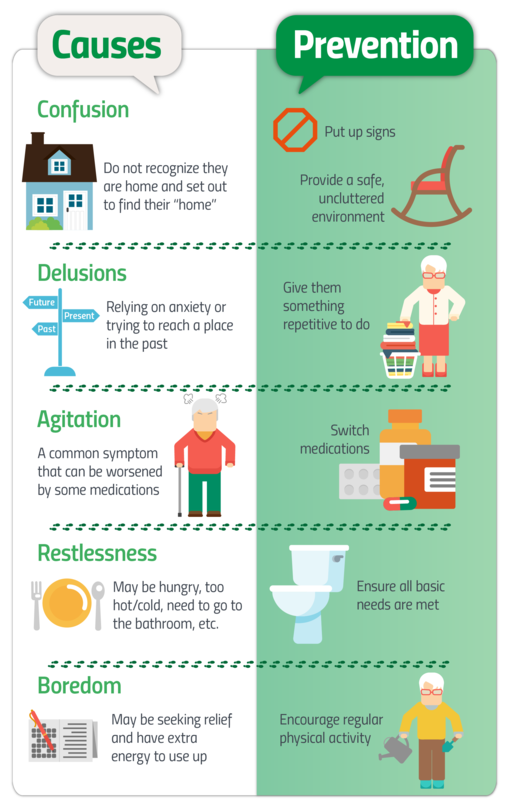 Dementia-driven wanderers are often motivated by the desire to “go home”, even when they’ve been living in the same place for a long time. As long term memories are most preserved with Alzheimer’s disease, they may yearn for an earlier childhood home that they can recall. This “I want to go home” syndrome among individuals with dementia can also translate into what’s been called an elopement risk, because they may put themselves at risk trying to return to where they think they belong. Wandering among individuals with Alzheimer’s disease may be a sign that they are experiencing toileting, hunger, or other physical needs. In addition, they may be longing to experience greater interaction with others or to fulfill other social needs, as dementia is often associated with the difficult side effects of loneliness and social isolation. As individuals age, they tend to use more prescription drugs, which can leave them with side effects such as wanton behavior and restlessness, which can result in wandering. Sleeplessness can also add to negative mood or affect and disorientation among persons with dementia. Healthcare and other medical professionals should communicate regarding treatment plans and prescribed medications to help prevent negative reactions and side effects. Disorders related to Alzheimer’s, as well as “mixed types of dementia”, i.e. the convergence of different types of dementia that co-exist in the same person, can often prompt disoriented individuals with Alzheimer’s to undertake impulsive actions, including wandering, often to alleviate feelings of fear, a common symptom in those experiencing memory loss. Individuals with Alzheimer’s disease can wander in random patterns, with stops, directional changes, and hesitation or uncertainty. Or, their wandering could be of the lapping type, i.e. walking around in a looping fashion. An analysis of the level of someone’s dementia and cognitive deficiencies will not likely shed light on the type of wanderer they will likely develop into. However, it can be important to pay attention to their patterns if they repeatedly engage in wandering behavior. As there many facets of our personalities that make all of us unique, personalities vary among individuals with dementia. Thus, there is not necessarily one strategy that will be effective to prevent wandering across all individuals. We should instead concentrate on providing them with as safe an environment as possible and fulfilling their unique support needs. Clinically speaking, the people who knew the individual best prior to the onset of dementia, and who have watched them closely since, are the most qualified to care for them. Naturally, in order for hired caregivers to make headway in that direction, and acquire some of that learning, they should tap close family members and friends for personal information, especially as it relates to life histories including previous work and cherished hobbies. This naturally applies only to individuals with dementia for whom added physical exercise is recommended. Physical activity in the daytime has been known to reduce wandering and symptoms of restlessness at night. Even going for a short walk together before dinner can be helpful. Exercise can also help stimulate the brain and potentially delay mental and physical decline. We mentioned above that sleeplessness as well as the need to go to the bathroom, or simply feeling “unclean”, or being thirsty or hungry, can result in wandering. Taking a few simple steps just prior to bedtime to ensure that all of these needs are met may save you from trouble at night. When you are taking care of someone who wanders, the first natural step is to secure the home and turn it into a safe zone for the wanderer. Examples of things you can do include: install locks and slide bolts on exterior doors out of sight, paint the doors the colors of the walls, or install child-proof door knobs. There are also motion detectors and other technological devices that can go a long way towards securing the house and increasing your sense of security during the night. For more on this, check out this article by The VA National Center for Patient Safety titled, A Toolkit: Patients at Risk for Wandering. Your loved one’s clothing should tell any concerned neighbor or police officer who they are, what their condition is, and where they belong. Inside their wallet may not be enough, in case they discard or lose the wallet. You may want to have them wear a medical ID bracelet or sew identification into their jacket or other outer clothing. Some devices and apps can help the caregiver know where their loved one is, whereas other devices serve to transmit longer-range GPS-type locator messages. For more on life saving location devices, you can check out this article. It can be important to ensure that neighbors and the local police station are aware of your loved one’s diagnosis and their potential or tendency to wander. 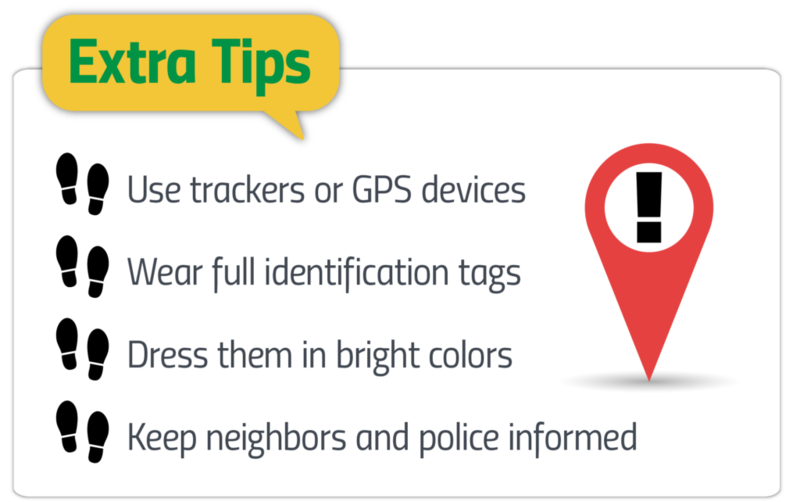 You may wish to include their photo and your contact information if they should come across your loved one wandering at night or during the day. Not all wandering stories about individuals with Alzheimer’s disease need to have devastating outcomes. Even as a member of a community, if you come across an older person who seems hesitant and possibly confused, or who is treading dangerously close to traffic or other hazards, do your part and see if you can help. Approach them gently at first, for the person in question may have other reasons for their errant behavior. Given the aging of our population, our communities need to become more age-friendly, and this includes increasing our awareness of the signs and symptoms of dementia and doing what we can to help those affected by the disease. Being aware and proactive when it comes to dementia-related wandering can help prevent unnecessary tragedies from occurring. For resources on how to become a “dementia friend” in your community, visit Dementia Friends USA.